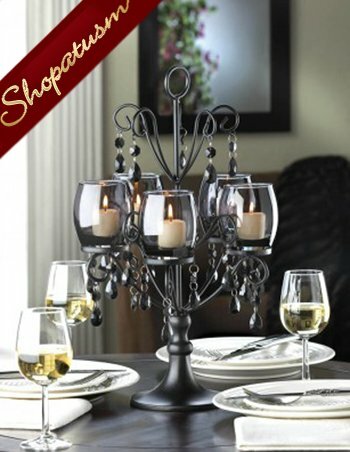 This is for a Midnight Elegance Black Candelabra Acrylic Beads Centerpiece from Shopatusm. The Midnight Elegance Candelabra is the perfect centerpiece for a romantic table setting, combining the shadowy glow of five candles behind tinted glass and glamorous faceted baubles. Item weight: 4.0 lbs. 10 1/4 inch x 10 1/4 inch x 17 1/2 inch high. Iron, glass, and acrylic beads. Votive candles not included. 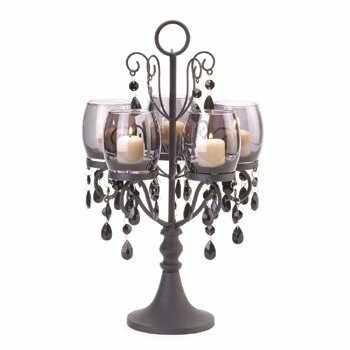 This item has a matching Chandelier & Wall Sconce sold separately!